Gene Bisbee, my bicycle blog comrade from Seattle, published the top bike-commuting cities in the country. Gene contacted me because he wanted to let me know that Tampa finished NUMBER 9 out of the 70 biggest cities and experienced "the largest growth in bicycle commuting in the past year -- more than double at 121 percent." 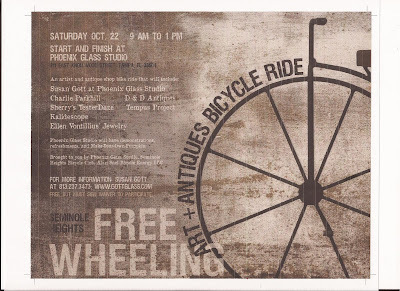 I'm working with Susan Gott, the famed glass artist of Seminole Heights, on an art and antique bicycle ride for Oct 22 from 9 am to 1 pm when we will visit six art studios and antique shops in the bike route in Seminole Heights. The bike ride will start and finish at Susan Gott's art studio on Knollwood Avenue right off Nebraska Avenue on the side street across from the Sulphur Springs Post Office. You must sign a ride waiver and be ready at 8:45 am. Thank you Doreen Jesseph of the Seminole Heights Bicycle Club for arranging the bicycle flier. SWFBUD appreciates Cure on Wheels being the presenting sponsor for the 2011 Bicycle Bash on Nov 6 at Flatwoods, so please participate in the Cure on Wheels ride one day before the Bicycle Bash on Nov 5 at Flatwoods. SWFBUD welcomes Buddy Brew coffee of Tampa to the Bash festival on NOV 6 at Flatwoods Park outside Tampa. Buddy Brew owners Dave and Susan Ward are friends of bicyclists and check out the bicycle cargo rig created by SWFBUD bike shop Velo Champ. Buddy Brew will be bringing that cargo bike to the Bash. Buddy Brew was at the Bicycle Bash last year and don't forget to visit their coffee shop on Kennedy Blvd. in Tampa. SWFBUD is the country’s only localized alliance of bike store dealers, comprising 10 shop owners and two lawyers. Group spokesman Alan Snel, a bicycle advocate and former metro newspaper reporter, has lobbied local governments to provide more bicycle resources and helped put on the touted Bicycle Bash festival each year. With the staggering statistics placing Tampa at the bottom of bike-safety lists, it’s encouraging to know that Snel and SWFBUD are fighting the good fight for two-wheelers. Snel also organizes the popular Hub Grub Bike Ride, and the next Bicycle Bash takes place at Flatwoods Park on Nov. 6. bicyclebash.com/swfbud.html, hubgrubride.blogspot.com. This year, Velo Champ has upped Seminole Heights’ retail profile, bringing life to Central and Hanna’s long-abandoned vintage storefronts. The sleek, distinctive one-stop shop offers a range of performance road, cyclocross and track bikes, as well as today’s most functional townie and commuter bikes. Mad props to owner Jordan Miller, who has helped organize and bring sanity to the PBR Pub Bike Rides and has been a staunch supporter of bike culture and safety in Tampa Bay. 6112 N. Central Ave., Tampa, 813-374-2424, velochamp.com. Clearwater isn’t known for much in the way of hip retail (exceptions include back-in-the-day shops Sagittarius and Crash and Burn, of course), but Chainwheel Drive is a survivor, thank God, a stellar standout amid the city’s strip-mall mediocrity. The mainstay in North Pinellas for the past three decades supports local bike clubs and state and national cycling organizations, providing support for rides and races all over the region. They are also involved with many different aspects of cycling, including racing, triathlon, mountain biking, cross country touring, and BMX. 1770 Drew St., Clearwater, 727-441-2444, chainwheeldrive.com. 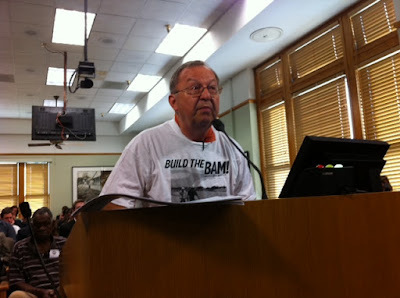 Jim Shirk, You Da Man -- Build The BAM! The construction crew at the USF entrance off Bruce B. Downs Blvd. protects the Kay ghost bike. SWFBUD thanks talented architect Nico Stearley of HOK in Tampa for creating this gorgeous map illustration of the BAM Network Plan -- SWFBUD's proposal to unify the Tampa Bypass Canal Trail, the South Coast Greenway and the Selmon Greenway into a unified superhighway system for bicyclists in the Tampa/Hillsborough area. I look forward to showing this map at a presentation before the Tampa City Council on Thursday morning. 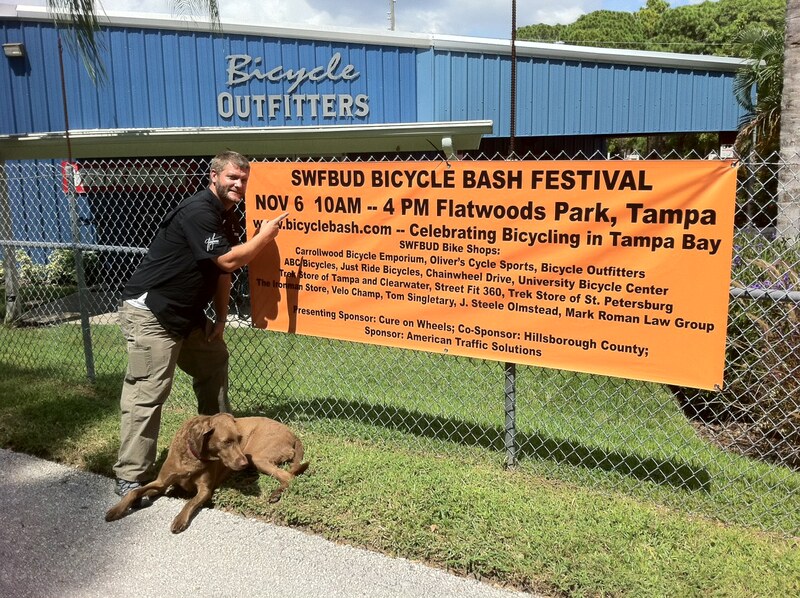 All 12 SWFBUD bike shops are amazing, including Bicycle Outfitters and owner Adam Beland pictured here with the 2011 Bicycle Bash Festival banner that he tied to the fence behind his store on the Pinellas Trail in Largo, Fla.
Shop at a SWFBUD bike shop because that store supports bicycle advocacy here in Tampa Bay. Check out more info about the Bash at www.bicyclebash.com. Several people have informed me about ambush muggings and assaults against bicyclists on the Pinellas Trail in St. Petersburg. They're usually along the stretch of Pinellas Trail between Tropicana Field and the high school -- in the area between 31st and 34st Streets. A few months agao, Rick Fidanzato, owner of ABC Bicycles and the Trek Store of St. Petersburg, sent me an email from a customer who was assulted while cycling about three months ago. There have been media reports of more attacks recently. And one bicycle friend passed along information about a cyclist named Brian who reported he was assaulted as well. Be on guard while cycling that section of Pinellas Trail! At 7:30 PM I was biking west on the Pinellas Trail between 31st and 34th St S in St Pete. About midway between the two streets is an "island", with railroad track remnants and a bench, where the paved path divides and goes around it on both sides. As I approached the island, I saw a man partially blocking the path to the right (north), and another man sitting on the bench on the left side of the island. I thought maybe I saw signs of one or more other people there as well (and I've since been told there were in fact four guys), but my attention was focused on the two guys I saw clearly. Because the path to the right was partially blocked, I rode around the island to the left. I'm fine -- a deep laceration inside my mouth and a headache for a day, but it could have been much worse, as proved to be the case for poor Michael Hall, who rode by the same spot an hour later (after dark) and got badly pounded. By then I guess the muggers had perfected their ambush technique enough to be successful. Fortunately for them and unfortunately for Michael, their second assault yielded a much better haul than their first one could have: Michael lost a $1500 bike, whereas all they could have got from me was a 10-year-old cellphone and a 25-year-old bike worth maybe $100. 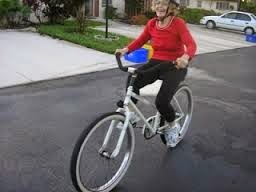 And another Pinellas Trail bicyclist added: "I rode by that area last Sunday morning @ about 9:30am. When I rode by that same bench there was a woman's purse sitting open on the bench. I saw no woman around. It seemed odd. I got to the top of the bridge over 34th and stopped and called 911. They put me over as a non-emergency call to St Pete police. They said they would check on it and I chose to leave the area. I am thankful I did not stop. It seems any time of day is not safe in that area until the police take things a bit more seriously." SWFBUD is happy to report that the famed Taco Bus of Tampa is sending its food truck to serve the hungry Bicycle Bash goers on Nov. 6. 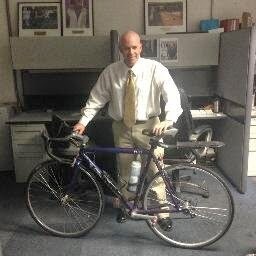 And Brendan Mclaughlin, a bicycle enthusiast and Channel 28 news anchor, will also be at the Bicycle Bash to offer some announcing in the afternoon of the Bash. My plane home from Interbike and Vegas Thursday afternoon was delayed an hour, so I stuck around the ISM bike saddle booth an extra bit, chatting with ISM owner Steve Toll and his wife Laura, who live in the Lutz area outside Tampa. Next to Steve's booth was an exhibit showing gorgeous bicycle pannier travel bags, which caught my eye because I biked across the country solo twice back in the 1980s and know the value of a reliable pannier bag that can hold a lot of gear and clothes. The salesman in front of the panniers was a friendly dude with a beard and a blue shirt and as soon as I strolled over to check out the bags, we immediately swapped stories about bike travels and panniers. His company is Arkel based in Oregon. I told him I represented 12 Tampa Bay bicycle stores who pay me to advance bicycling in our market and he was intrigued because first, he would love those shops to sell his panniers. And second, he's a Plant High grad and from Tampa Bay. He's also a USF alum. 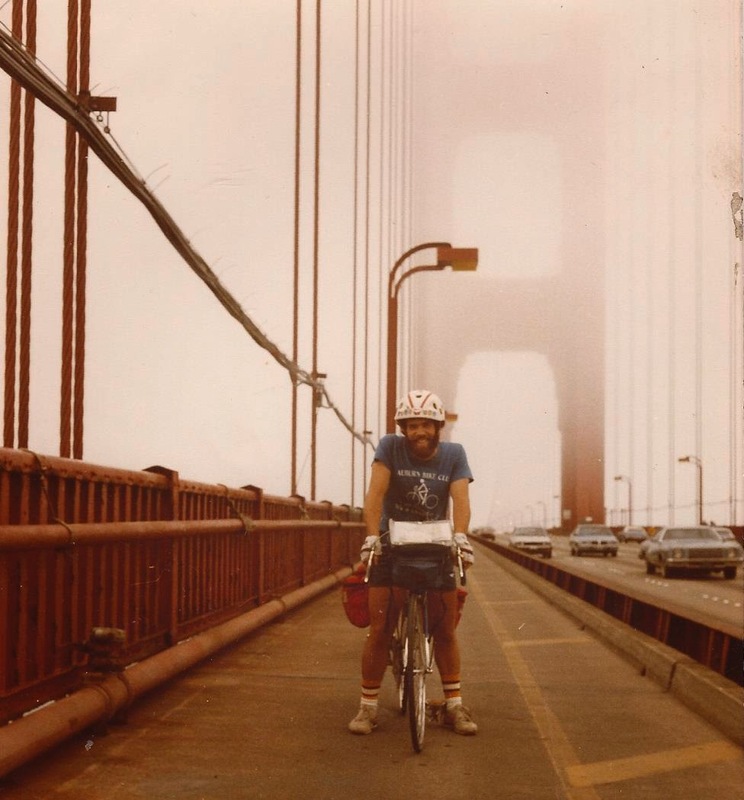 His name his Joe Kurmaskie, known as the "Metal Cowboy" for his long-distance bike travel books he has written. 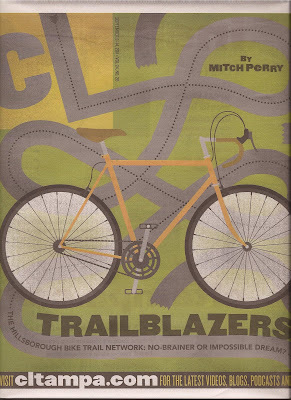 They're wonderful books, packed with funny tales of bicycling long distances and meeting wacky folks. I enjoyed Joe's books because they reminded me of my cross-country bike rides and the bike adventure stories I wrote for the Syracuse Herald-Journal and the Middletown (NY) Times Herald-Record. In fact, I love reading most bicycle travel books and have a nice collection of the genre, which includes two of Joe's books -- Metal Cowboy and Riding Outside The Lines. Joe immediately pulled out his latest book, called You Might Be A Cyclist If . . . It's full of funny quips that finish the title of the book. Joe signed it and gave it to me. It was fun reading on the journey home to Tampa. Naturally, we hit it off and I told Joe that he HAS to come to the Bicycle Bash to show his Arkel panniers (Joe said he's a partner in the company) and meet his fellow Tampa Bay bicyclists. Joe lives in Oregon, so it's a haul. But Joe is a kindred spirit, so we promised to try and make this happen -- a Metal Cowboy appearance at the Bicycle Bash. If you love bicycles, you should plan an outing to Interbike -- the bicycle industry's annual trade show and gathering. Lots of super bicycle gear eye candy and it's like a family reunion with all the different branches of the bicycle family coming together to network, check out new products, meet old pals and hob-nob about bikes in Las Vegas. I'm back in Tampa after a Tuesday-Thursday excursion, which included one day at the outdoor demo in Boulder about 40 minutes from Vegas and two days inside the Sands convention center attached to the Venetian hotel in Las Vegas. Ben Coffey of Cinelli is a Facebook friend and I got a chance to meet Ben for the first time at the outdoor demo and trade show this week. Mascots are hard to resist -- no matter what the sport. A damp morning and cloudy afternoon kept the crowd low at the outdoor demo on Tuesday. Back at the convention center on Wednesday, lots of room to test e-bikes. The Surly wooden rollers were a big hit. Here's ISM owner Steve Toll, triathlon star and ISM team member Michellie Jones and big Dave of ISM. It was great to see Steve and his wife Laura and the ISM crew at Interbike. How about an electric cargo bike? There's always a fixie in the house. The Electra display is always a treat. Bicycle eye candy all around. 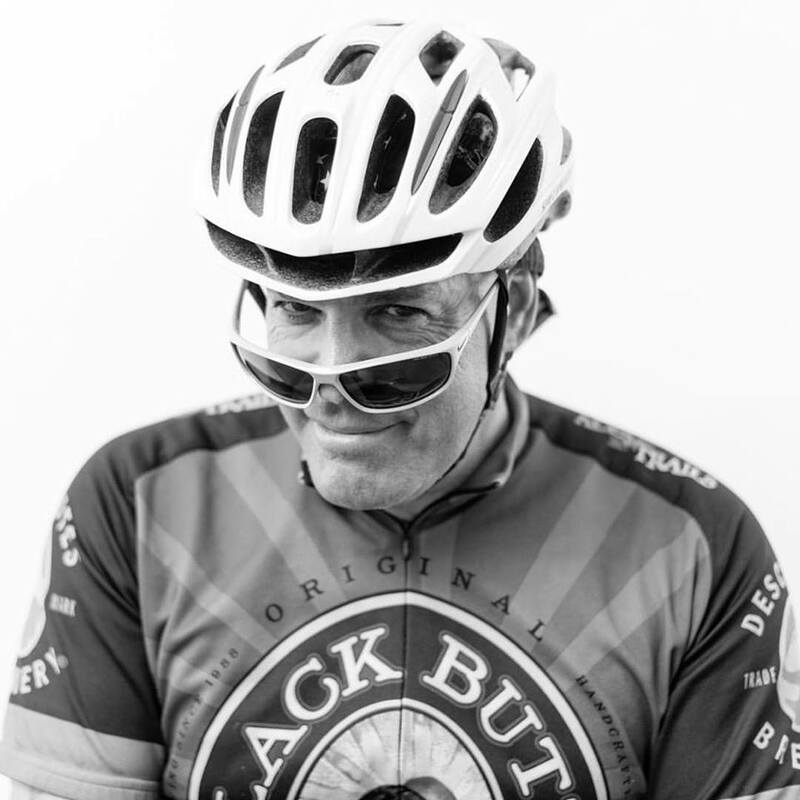 and Andy Clarke of the League of American Bicyclists. My pal Ellen Pierson of the Policy Unity Tour enjoyed her rookie Interbike experience. I met my kindred spirit, Joe "Metal Cowbuy" Kurmaskie, who has written bicycle travel books and now is a partner in Arkel bicycle panniers in Oregon. Joe is from Tampa! And I begged Joe to come to the Bicycle Bash to tell funny bike travel stories and show his bike panniers. SWFBUD is on the scene at the Interbike show, the bicycle industry's annual get-together where some 1,200 bicycle brands set up exhibits and thousands more from the bicycle world come to schmooze, network and hob-nob. 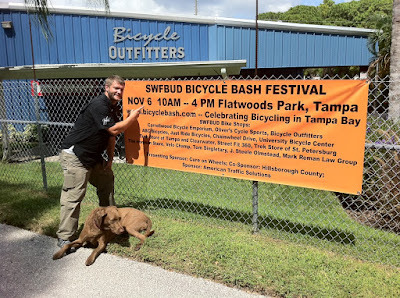 SWFBUD is spreading the word about our 2011 Bicycle Bash festival on NOV 6 at beautiful Flatwoods Park and is recruiting exhibitors to be Bash vendors in less than two months. SWFBUD is also spreading the word about the BAM (Bicycle Area Mobility) Network that we have lobbied for in the Tampa Bay area. The BAM Network is a unified paved trail system made up of the Tampa Bypass Canal Trail, the South Coast Greenway and the Selmon Greenway as a superhighway for bicyclists in the Hillsborough County and Tampa area. Check out Creative Loafing for a great story about the BAM. SWFBUD is happy to see SWFBUD bike shop owners on the scene, such as David Luppino of Just Ride Bicycles, Tom Jessup of Chainwheel Drive. Jana and Andy Clark of Street Fit 360, and Carlos Mirabal of University Bicycle Center. On the flight to Las Vegas from Tampa, SWFBUD bumped into Tom's son, Scott Jessup, from Chainwheel Drive and also Brian and Jen are here from Chainwheel as well. Waiting for the flight fromk Tampa, I also chatted with Bicycle Bash supporter Clayton Bramlett of American Classic wheels, as AC owners Bill and Ellen are on the scene at Interbike, too. SWFBUD also appreciates the support of Steve and Laura Toll, owners of the incredible ISM bicycle saddle. Steve and Laura are from the Tampa area and are big supporters of SWFBUD, the local cycling scene and the kids' triathlon programs put on by Suzanne Henslee. Steve and Laura are spreading the word about ISM and people are listening. 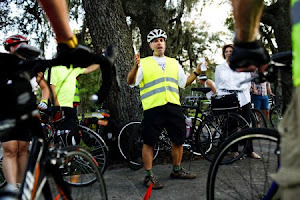 SWFBUD has caught up with Andy Clarke, executive director of the League of American Bicyclists, who wrote letters of support to Hillsborough County commissioners and Tampa city council members advising them to help the local bicycle scene in light of the 12 bicyclists killed in Hillsborough County in 2010. I also enjoyed chatting with Bill Nesper, the guy at the League who runs the program that awards bicycle-friendly honors to towns and businesses. Bill has a personal connection to Tampa because his wife is from the Tampa area, so Bill keeps tabs with the SWFBUD work to make the Tampa Bay area a more friendly place for bicyclists. It was also great to see Tim Blumenthal, executive director of Boulder, Colo.-based Bikes Belong, which is collecting 1 million signatures from people who favor bicycling to give to the power brokers in Washington, DC. By the way, please call your local US senators and congressmen and tell them to keep funding for bicycle infrastructure. Bikes Belong will be at the Bicycle Bash (bicyclebash,com) so please sign the 1 million bicyclist petition at the Bash on Nov. 6. My cycling pal Ellen Pierson has rolled into Vegas and it's her first Interbike, so she's in for a treat today when she sees the endless sea of bicyle exhibitors at the gargatuan Sands Expo and Convention Center. I arrived Tuesday morning to torrential rain in the Vegas area -- how bizarre is that? I came Tuesday to experience the second day of the Outdoor Demo in Boulder City and took the shuttle bus from the convention center to the Bootleg Canyon park, where the demo is staged. It stopped raining at the demo by the time I got there, but threatening skies kept the crowd low and subdued at the demo, where I met Facebook friend Ben Coffey of Cinelli bicycles. Ben might be from Santa Fe, NM but he also supports SWFBUD and bicycling in Tampa. Ben, how about coming to the Bicycle Bash?! It was nice to see Dan Thornton and Fred Clement of the National Bicycle Dealers Association (NBDA) -- and remember SWFBUD's own Tom Jessup of Chainwheel Drive is a NBDA board member. 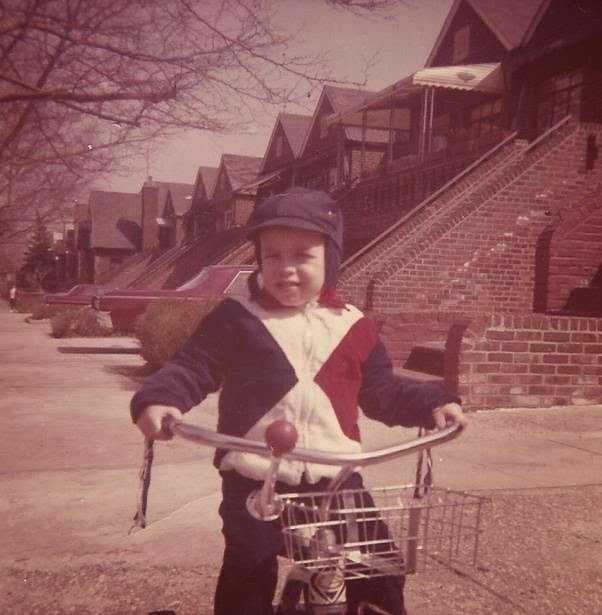 I also hope today to catch up with my friend Ira David Levy from Chicago, who plans to start of a PBS TV show called "Pedal America." I'll be back late Thursday night and will post photos when I'm back in Tampa. This morning I biked with the Seminole Heights Bicycle Club to Hyde Park Village and back. Nice bicycling everyone. Thank you city of Tampa transportation dept. for re-working North Boulevard with bike lanes, shared road markings and Share The Road signs -- we need more. Beautiful Flatwoods Park -- as seen from Morris Bridge Road. Last year was a horrible year for bicyclists in Hillsborough County, where a dozen cyclists were killed. This year, much better. The number of killed bicyclists is two so far -- until early this morning, when a a bicyclist was killed in Valrico early in the morning. Florida Highway Patrol says the bicyclist failed to yield a right-of-way at an intersection. I'm aware of three bicyclists killed in Hillsborough in 2011. SWFBUD's plan for a regionwide paved trail system called the BAM Network got a big boost today when Creative Loafing wrote a cover story on the BAM in its current edition that just hit the streets. The SWFBUD Bicycle Bash T-shirt just came out and it features the "Build the BAM" message on the front. The T-shirt costs $10 and the money will go to promoting the Bicycle Bash and the BAM. Contact Alan Snel at alansnel@yahoo.com if you would like to buy a shirt. Build The BAM T-shirts Are In! 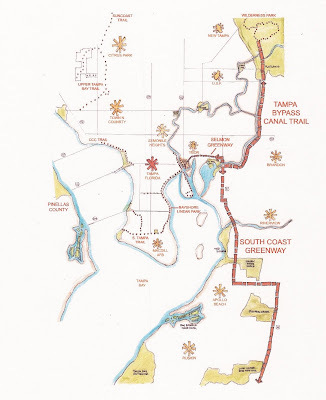 SWFBUD is pushing our local elected leaders to Build the BAM (Bicycle Area Mobility) Network -- a regional multi-trail system that would include the Tampa Bypass Canal Trail, the Soputh Coast Greenway and the Selmon Greenway. Check out Tampa bicyclists Jason Wilson and Nereia Cormier sporting the Build the BAM shirts that are this year's Bicycle Bash T-shirts. If you want one, it only costs $10. Contact alansnel@yahoo.com. About once a year this story pops up somewhere across the country -- a well-intentioned police officer or a principal tells parents that they cannot allow their kids to ride a bicycle to school because the authority believes it's too dangerous. This time the case comes from Tennessee, where a police officer told a mother that she would be arrested for child neglect if she allowed her 10-year-old daughter to ride her bicycle to school. The police officer thought it was too dangerous for mom to allow her daughter to bike one mile school. SWFBUD is happy to report that a new bike store has joined the bike store alliance. Velo Champ, owned by Jordan Miller, is the 12th bicycle store in the Tampa Bay market to join. Jordan is a strong bicycle advocate and appreciates SWFBUD's work to further the cause of cycling in the Tampa Bay area. Jordan's Velo Champ store is located in the Tampa neighborhood of Seminole Heights and is a specialty boutique bike shop that sells brands such as Cinelli road bikes, Linus urban bikes and Brooks accessories. Jordan can be reached at info@velochamp.com. Please welcome Jordan to SWFBUD. SWFBUD appeared before the Hillsborough-Tampa MPO Board this morning to urge the board members to amend the long range plan to accommodate the construction of the proposed Courtney Campbell Causeway Trail beyween Tampa and Clearwater and to also approve a feasibility study of the Tampa Bypass Canal Trail road crossings. I'm happy to report the MPO Board -- which is made up of Tampa city council members, Hillsborough county commissioners and other transportation agency heads -- approved both. Here's my compatriot Jim Shirk, all-universe bicycle volunteer and chairman of the Hillsborough-Tampa Bicycle Pedestrian Advisory Committee, just completing his comments advising the MPO board to approve the Bypass Canal Trail feasibility study for crossings and to amend the long range plan to accommodate the Courtney Campbell Causeway Trail. Here's a Florida DOT staffer explaining an item about the Courtney Campbell Causeway Trail. MPO staffer Michelle Oglivie shows photos taken by SWFBUD on a bike ride along the Bypass Canal Trail, which is open to the public but grassy with some access but other more difficult access points at a few road crossings. This is what SWFBUD wants -- a paved trail along the Bypass Canal. This is the prototype -- a half-mile section along the canal at the Bypass Canal Park east of Rt 301 and south of I-4. Please contact these Hillsborough MPO Board members and tell them you want them to support the the building of the Courtney Campbell Causeway Trail and the Tampa Bypass Canal Trail as part of the BAM Network (Bicycle Area Mobility),which also includes the South Coast Greenway and the Selmon Greenway. There is a MPO Board meeting Tuesday at 9 AM at the County Center on Kennedy Avenue in downtown Tampa and attend to speak out at the meeting foe these trails and the BAM Network. The Ormond Loop is a designated scenic route up and down the Florida Atlantic Intrascoastal just north of Ormond Beach, which is just north of Daytona Beach.